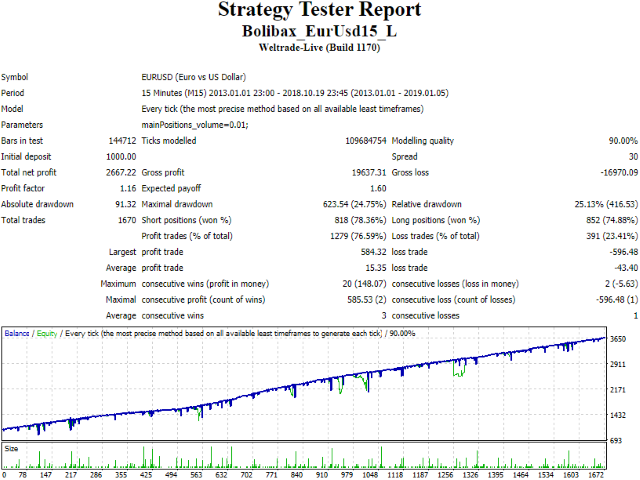 Bolibax is a series of fully automated trading advisors based on the Bolinger Bands indicator. To ensure successful trading, the system is built on two algorithmic modules: "Strategy" and "Positions Management". Bolibax EurUsd Locking is a variant of the expert advisor that is fully optimized and configured to trade on the EurUsd currency pair. The prefix "Locking" implies that a locking of unprofitable positions is used as the main algorithm of the management module.